PHNOM PENH (7 Nov 2018) – When Cambodia lost to Malaysia in a friendly in early September, they only had a week’s preparations. This time around, Cambodian head coach Felix Augustin Gonzalez Dalmas has had more than a month to get his charges ready and is hopeful it will be enough to turn the tables on the Malaysians in the opening AFF Suzuki Cup 2018 match here tomorrow. That, along with the desire to exact revenge and massive home support from over 35,000 fans, may just be enough for Cambodia to pull ahead tomorrow. 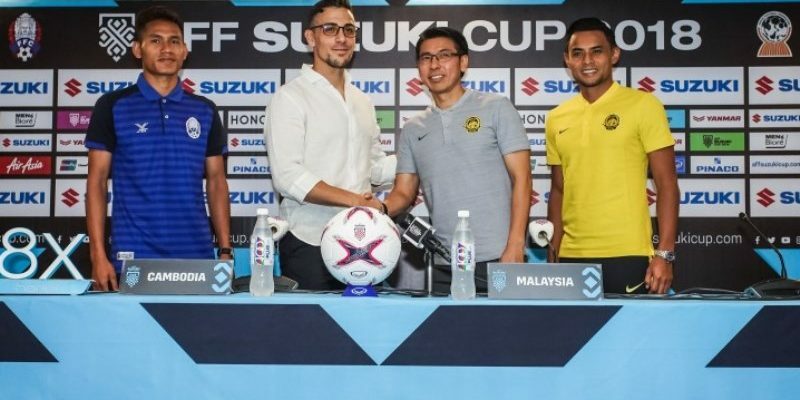 But Malaysia’s Tan Cheng Hoe, who was the assistant coach when Malaysia won the title in 2010, explained that the dynamics of a friendly and competitive match are different. “A friendly is different from a competitive game. It will be a different set of players and I know it’s not going to be easy,” Cheng Hoe said in reply to a journalist’s question. Malaysia have been brought in several new faces, including Gambian-born Mohamadou Sumareh, who scored twice in his debut in a friendly against Sri Lanka. For the Cambodian team, there is also the added motivation of their National Day which falls on Nov 9. A victory would surely be the perfect gift for Cambodia. On Japanese star Keisuke Honda, Dalmas said: “He won’t be here for the opening match tomorrow but we have been communicating regularly.” Honda, the team’s General Manager, is likely to be around for the later matches. Meanwhile, both team skippers, Soeuy Visal and Mohamad Zaquan Adha, said their teammates are in high spirits and eager for tomorrow’s match. “It’s important that all the players give their 100 percent, as the coach said, we want a positive start,” Zaquan said.